Having Mildred has really cut into my reading time in the last couple of months, so I made it a point to go to the local library and renew my membership early this month. One of the great things about my library is that they participate in Overdrive so, along with being able to check out books from my local library, I can check out ebooks and audiobooks online. It’s given me an opportunity to “read” a few more books this month, since I can’t exactly flip pages while I’m holding Mil. I’ve even officially completed my Good Reads reading challenge goal for the year. Now I need to decide if I want to increase my goal, or just let it stand. What are your thoughts? The Dream Master is a Nebula Award-winning, classic science-fiction novel by Roger Zelazny. The book follows a man named Charles Render who works as a psychologist, of a sort, creating dreams to help people come to terms with their problems. I’m still not sure how I feel about the ending of this novel. I felt like it just stopped, without any satisfying conclusion. Based on the content of the novel, I’m sure that Zelazny’s goal was to leave the reader confused about how things ended, but that didn’t make me any happier about it. The Dream Master was, however, a psychologically interesting read, so I could recommend it for that reason. Just be prepared to deal with typos in the ibook edition from Simon & Schuster (the only version I can find available in print) because I don’t think they bothered to edit their copy. 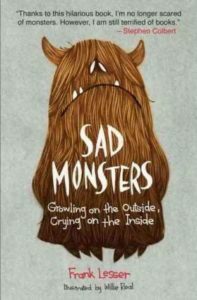 A while back, I picked up a copy of Sad Monsters: Growling on the Outside, Crying on the Inside by Frank Lesser (illustrations by Willie Real), because I thought it looked funny. And I’m happy to report that this collection of short stories is hilarious. It was a great book to have on hand when I only had short snippets of time to myself to pick up a book. And with the new baby, that seems to be all that I have. 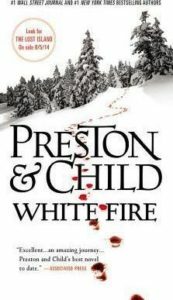 White Fire is Pendergast novel #13 by Douglas Preston and Lincoln Child. I listened to the audiobook edition, narrated by René Auberjonois. Auberjonois is the character actor who played Odo in Star Trek: Deep Space 9. Once I put that together it seemed a bit strange to listen to Odo tell me stories, but he does wonderful voices, really immersing the listener in the story, so I got over that pretty quickly. This particular Pendergast novel follows the agent to a small ski resort town as he helps Cory Swanson (who previously appeared in Still Life with Crows) to work on some research. But as with all of Pendergast’s adventures, things are never so simple. Not long after arriving, an arsonist begins setting fire to some of the homes in the affluent part of town, killing those living in the homes. All of these things, and a lost tale of Sherlock Holmes are interlinked beautifully in this novel. I highly recommend it. And if you are a book-on-tape sort of person, I think you will enjoy Auberjonois’ narration. 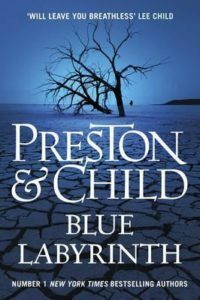 Blue Labyrinth is Pendergast novel #14 by Douglas Preston and Lincoln Child. This novel opens with Pendergast and his ward, Constance Green discovering the body of one of Pendergast’s sons on his doorstep. From then on, the novel twists and turns as A.X.L. Pendergast tries to discover who killed his son, while the agent’s friends try to discover how to save him from a deadly scheme. I listened to the audiobook edition of this novel as read by René Auberjonois, and once again was pleased with his narration. Crimson Shore is Pendergast novel #15 by Douglas Preston and Lincoln Child. The story opens at Pendergast’s mansion on Riverside Drive in New York. It is here that Pendergast meets a man who’s entire cellar full of wine has been stolen. This isn’t the type of case Pendergast normally investigates, but the chance to procure a rare bottle of wine convinces him to investigate. Pendergast and his ward, Constance travel to a small coastal New England town to investigate, uncovering a long forgotten tragedy which leads to killings in the present day, and a complex murder mystery. I found the ending to this novel to be unsuspected, and am looking forward to reading the next installment, The Obsidian Chamber, soon. I listened to the audiobook edition of this novel as read by René Auberjonois. 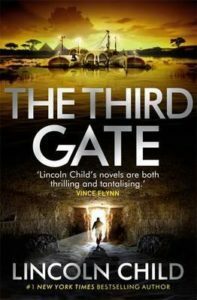 The Third Gate by Lincoln Child is the 3rd book in his series featuring Jeremy Logan. Logan is an “enigmologist”, meaning that he studies enigmas, the unexplainable. This particular novel follows Logan as he travels to an archeology site to help determine if the cause of strange things happening to the crew are part of a curse. Along the way, Logan meets several interesting characters including a famously secretive archeologist and a woman who’s near death experience allows her to speak to the dead. Even with all of the shenanigans involving curses and speaking to the dead, the book is well researched and written, making for a captivating and even believable read (or in my case – listen). I listened to the audiobook edition of this novel as read by Johnathan McClain. The Forgotten Room is the 4th book in Lincoln Child’s Jeremy Logan series. This book follows Logan as he investigates the mysterious suicide of a researcher at a prestigious think tank. His research leads him to a hidden room and a lost research project. With much more science than The Third Gate, I found The Forgotten Room to be more believable, and therefore a bit more enjoyable. 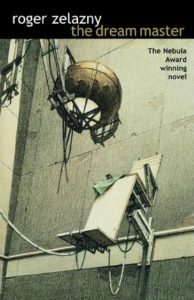 I listened to the audiobook edition of this novel as read by Johnathan McClain. Bury My Heart at Wounded Knee by Dee Brown– This is a long-term reading project for me. Speakers of the Dead by J. Aaron Sanders– I am listening to the audiobook edition of this novel. So, as you may have noticed, I’m on a bit of an audiobook kick right now. Do you listen to audiobooks? I do, though my choice is much more limited than yours. Yes, I know, there’s Librivox, but I’ve had some bad experiences with them, particularly with readers of children’s books. There’s one lady who recorded several Oz books, but she tends to read like a squeaky machine, and her voice rises? at the end of every phrase? like it’s a question? There’s another reader who goes the other way, her every sentence ends on a downward fall, like she’s moaning about something. I started loving audiobooks when it came to listening to the Bible on cassette tape, it was then in the 1980s. Having it read for you makes you notice things that you might not when reading to yourself. The French Protestant Bible Mp3 that I have is just wonderful; not only because the translation itself is fantastic–which it is–but the reader is a presenter for RadioFrance and his voice is so flexible and so clear. Currently I’ve been on a Jane Austen kick. Persuasion was never my favourite Austen book because Anne Eliot seemed to be so spineless, until I saw Sally Hawkins in the ITV movie of it. Now I’m listening to Nadia May reading the book, and getting a lot out of it. Do see the movie if you can, I recommend it. The first time I heard May read a book was Pride and Prejudice and at first I thought it was Lauren Bacall! You’ve seen my Goodreads review of that audiobook. I also have her audiobook of The Pilgrim’s Progress. A good reader can make a book live, just as a poor one (yes, I’m looking right at YOU, Stephen Fry!) can take all the pleasure right out of it, even if it’s a book you love. Especially if it’s a book you love. If you know anyone in the states with a library card for a library that is part of Overdrive, you might see if they use that part of their account. If not, you could use it for borrowing ebooks and audiobooks. If you get the opportunity, I recommend finding something read by René Auberjonois. I’ve been highly impressed with his narrations. Congratulations on your new baby. I admire you for your blog, especially now that you are even busier! Like you, I also love audio books, but not because I have a baby. I’m a retired music/kinder teacher. I love to listen as I do daily chores around the house, sew, knit, exercise, etc. I have a library card from two local libraries and also use Overdrive. Thank you for the book suggestions. I generally read historical fiction, romance, and murder mysteries. Right now I’m listening to “The Zookeeper’s Wife,” by Diane Ackerman, set in Poland, right at the beginning of WWII, dealing with animals and hiding Jews at a zoo in Warsaw. I recently read “Lilac Girls” by Martha Hall Kelly, also set in WWII, dealing with 3 very different characters that connect through the events of the war. I learned about the real Lilac Girls, polish concentration camp survivors who were deformed by German doctors experimental surgeries. I’ve also been reading lighter books by Debbie Macomber and Nora Roberts. Have you seen the website Goodreads? It’s a good site to maintain a list of books that you’ve read, and get good suggestions and reviews. I do use Goodreads. 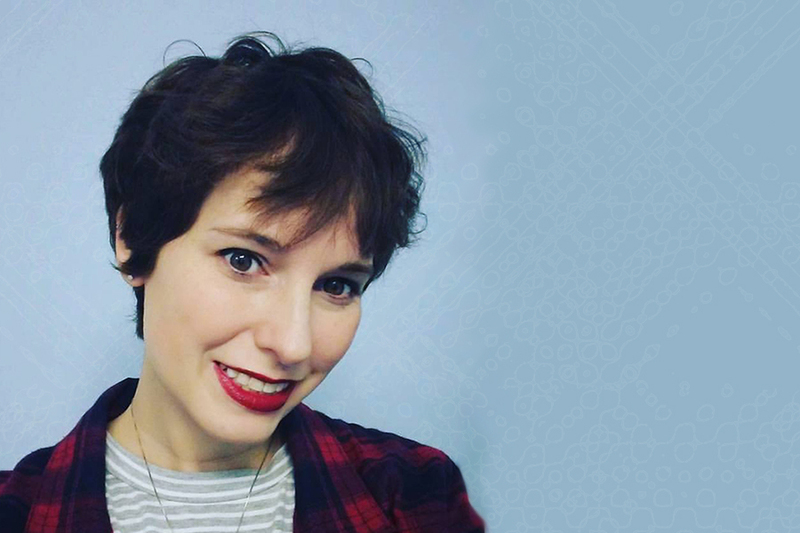 You can find my profile here: https://www.goodreads.com/user/show/6903985-andrea-turner. Feel free to friend me if you want. It is a big help in keeping track of the books I have read. I also love the recommendation feature, as I have a habit of reading all the books I can by an author I like and not knowing what to read next.